IBM is a renowned technology company known for their quality products. Beginning as a computer hardware company in 1911, they have established themselves as one of the top leading companies. As you may know IBM produce their own printers and offer cartridges; now they have ventured into manufacturing a true likeness toner cartridge for HP and may produce more of other brands like Brother, Samsung and Canon in the future. With the guaranteed print quality and page yield of an original cartridge, the IBM Ultimate cartridges come with a Total Performance Warranty. That means that not only will the print quality and page yield meet or exceed the originals’, but that the product also comes with an unconditional lifetime guarantee that the last page will look as great as the first! All this comes with no risk to your printer’s warranty whilst offering amazing savings against original cartridges, which makes IBM Ultimate cartridges a great alternative. Offering cost savings to the enterprise user and certified by IBM, these high quality cartridges make great replacement toner cartridges! Here is an example comparison for a toner cartridge where we offer the originals, compatible, remanufactured and IBM Ultimate. You can view the cartridge types for this particular product by clicking this link. As you can see, if you require a true alternative to originals you should consider going for the IBM Ultimate. Rather than paying £152.99, you are paying £65.99; that is a total saving of £87. You could even buy two IBM Ultimates and still have saved! If you don’t like using compatible cartridges and prefer the original, we highly recommend to try the IBM Ultimate cartridges, which are made by the IBM company and you will be 100% satisfied and won’t go back to the originals. That is a guarantee! 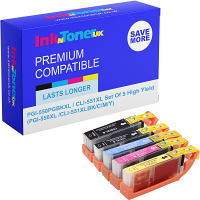 To view all toner cartridges that are offered by IBM at Ink n Toner UK, you can click this link.